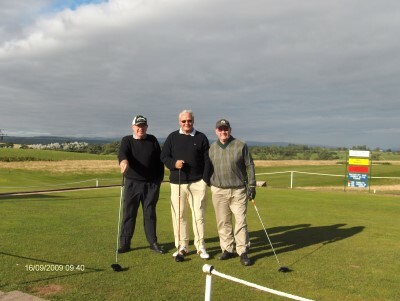 The Middleton Tyas golf society originated sometime in the 1970’s when a handful of men from the village got together to play golf on a regular basis. From there it grew into what is now a well-established Golf Society with numerous members from the village. The competition is for people who live in the village and their invited guests, and comprises a morning 9 hole team competition and an afternoon individual stableford competition. 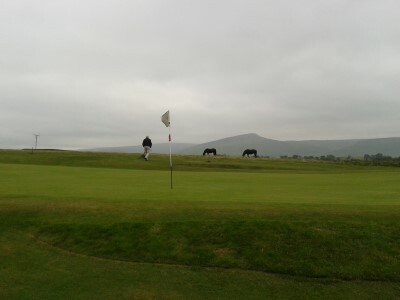 The competition takes place at the stunning Appleby Golf Club in Cumbria on the second Wednesday in September every year, with prizes for both the team & individual winners, which are donated by the players themselves, and everyone wins something, ensuring that no-one goes home empty handed. 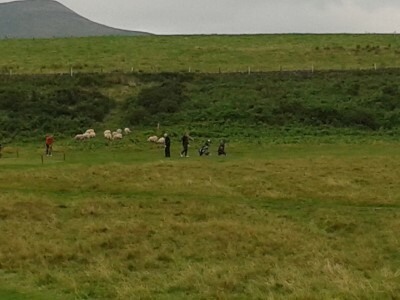 The scenery at Appleby is beautiful and the course is shared with the local sheep, who are prevented from grazing on the greens by small electrified fences. The shield was originally established in 1982, when it was on a smaller version of the one shown in the photographs, and the new shield made & donated by Geoff Yarrow in 1993. 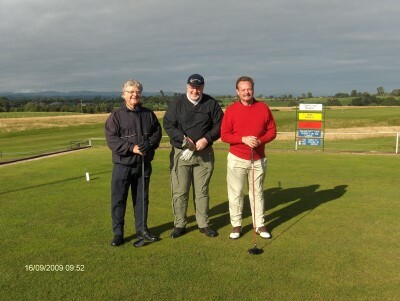 (Geoff is in the middle of the second photograph, together with Bill Agar & Bob Aitken, who are regular society players at Appleby, seen here on the 1st tee in 2009). 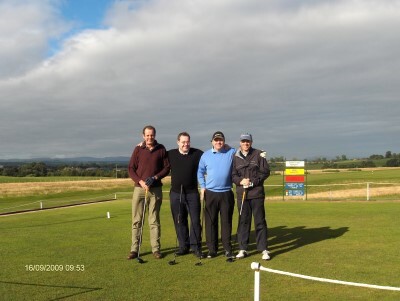 The Green Jacket, complete with the Middleton Tyas Golf Society emblem was introduced in 2003 by Geoff Smith (seen in the red sweater) as a fun tribute to the US Masters winner’s green jacket. The first winner of the jacket being James Nicholson, whose mother Yvonne also designed the badge on the jacket. 2012 was the 30th anniversary year of the present competition and everyone who has ever been involved on the day, will be hoping that it will continue for another 30 years! 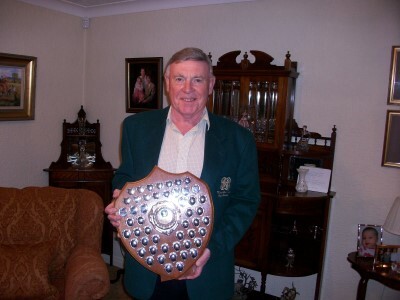 A number of players have won the competition twice, (including Jim Wilkinson and Geoff Yarrow,) and it is customary for the winner to arrange the following year’s competition: Geoff Yarrow has been instrumental in helping the winner to arrange the next year’s competition for the past few years. If you would like to take part in the competition, look out for notices within the village news and on notice boards for details.